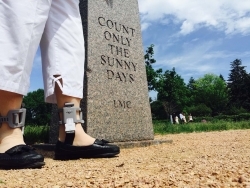 “It helped my balance!,” “Gave me more confidence, I felt stronger!,” “No dizziness at all, like something was suppressing dizziness!,” “Made me feel like a normal person!,” are statements from participating Veterans in a study of Walkasins at the Minneapolis VA.
Minneapolis, MN, September 14, 2017 --(PR.com)-- RxFunction, manufacturer of Walkasins - the first Wearable Sensory Prosthesis to help improve balance, is reporting results from a research study recently finished at the Minneapolis VA. Walkasins can help patients who have peripheral neuropathy and experience gait and balance problems. The Foundation for Peripheral Neuropathy reports an estimated 20 Million Americans have some form of peripheral neuropathy, commonly due to diabetes or chemotherapy. Reports indicate that over 40% of diabetic patients develop neuropathy that affects balance and increases fall risk. In addition, past exposure to Agent Orange may be a cause of chronic peripheral neuropathy in the Veteran population. The Walkasins Foot Pad detects when the wearer begins to lose balance, and sends a signal to a cuff worn around the calf. The cuff vibrates to help the wearer know which way they are leaning, allowing them to correct their balance. Thirty-One Veterans with peripheral neuropathy and balance problems were randomized to a short therapy treatment session wearing Walkasins turned either on or off followed by a rest period, and a 2nd therapy session with the on-off conditions crossed over between the groups. “Using Walkasins more than doubled the proportion of patients who showed meaningful improvement in clinical outcomes related to gait and balance,” says Dr. Lars Oddsson, co-inventor of the technology and President of RxFunction. “This study confirms the short-term immediate effects of Walkasins use on functional balance and gait speed and it helps us better identify the patients who most benefit from using Walkasins, which is important to understand when Walkasins become available for prescription,” Oddsson says. The half-way point of the study was presented at the Design Medical Devices Conference in Minneapolis by researchers at the Minneapolis VA and revealed improved Functional Gait Analysis scores (a clinical outcome of dynamic balance), increased walking speed and improved 4-Stage Balance scores (a clinical outcome of static balance). The final results of the study will be submitted for publication in peer-reviewed journals. “We are so excited to work with our Veterans in this study. We are learning more about their needs and how the Walkasins can help with balance and mobility problems,” says Dan Leach, CEO of RxFunction. Development of Walkasins have been supported by an SBIR grant from the NIH (AG040865). RxFunction is a wearable technology company with an initial focus on developing and leading a new business segment within the U.S. medical grade assistive technology marketplace. The Company’s vision is to improve physical ability for social participation and quality of life. Privately held and headquartered in Minneapolis, MN, RxFunction has taken assignment of patented technology developed by Co-founder, Dr. Lars Oddsson, as a research professor at Boston University’s Neuromuscular Research Center, and funded privately supported under grant No. AG040865 awarded by NIH’s National Institute on Aging. Walkasins have not been submitted to the FDA for review, and are not available for sale at this time.